Our 4.5kg Dry Chemical Fire Extinguishers are suited to residential, commercial and industrial environments that have mixed fire hazards including fire classes A, B and E. This is a great multi purpose fire extinguisher that delivers a fantastic level of fire protection while still being compact enough to be used by anyone and installed in to smaller areas. Buy our high quality 4.5kg dry chemical fire extinguishers online and save over 50% at this amazingly cheap price. Dejan from Fyshwick, Stuart from Pinkenba & 42 others recently purchased this item. 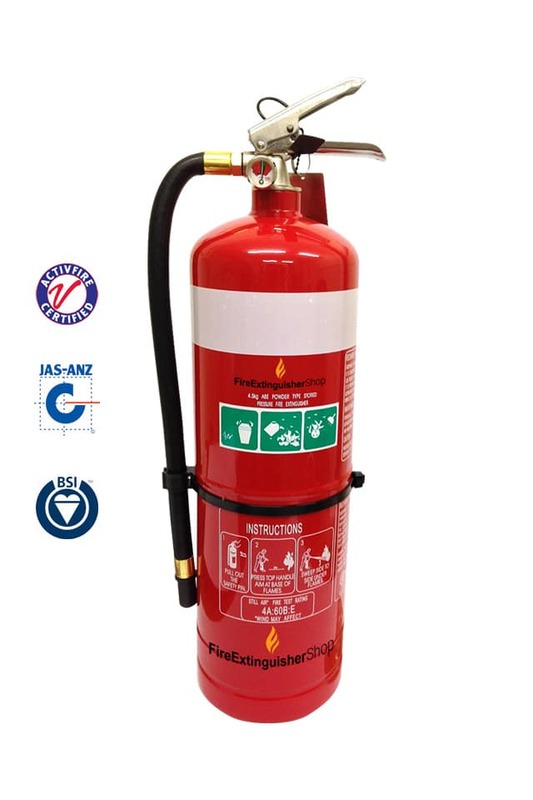 The 4.5 kg Dry Chemical Fire Extinguishers can be used to protect your building, office, shop, factory. It comes with a wall bracket and maintenance test tag. This is a great multi-purpose dry chemical fire extinguisher that delivers a fantastic level of fire protection which makes it one of our most popular fire extinguishers. Buy online and save over 50% at this amazingly cheap price. This 4.5kg dry chemical fire extinguisher is one of our most popular fire extinguishers and for obvious reasons. It is powerful and a great size that anyone can use. This fire extinguisher features a hose which makes it better and easier to aim the dry chemical powder directly into the fire for increased efficiency. This fire extinguisher will provide you with a high level of protection for your office, shop, storage facility, warehouse or even tow trucks and heavy machinery. Buy online today at this incredibly low price. Our 4.5kg dry chemical fire extinguisher is certified and approved to Australian Standards. Dry chemical fire extinguishers are a highly versatile type of fire extinguisher that will handle most common types of fire risks. It is suited for fires of types A, B and E. Dry chemical fire extinguishers are versatile to use. They are suited to high risk environments that have mixed fire hazards. They can handle fires containing flammable liquids and gases. They are also ideal for fires in a range of vehicles such as trucks, heavy machinery and buses. chemical fire extinguishers are not a conductor of electricity which means they are effective on electrical fires. The 4.5kg dry chemical fire extinguisher can be used on a variety of fire types while still being compact enough to be installed in to smaller areas. This is a perfect size for your residential, commercial and or industrial building or your office, shop, workshop or hotel. It is an extremely flexible fire extinguisher that has enough size to offer you great fire protection. It comes delivered with a wall bracket for easy installation. This dry chemical fire extinguisher can be used on fires involving flammable liquids and gases like petrol, LPG, oil and paint. And as mentioned previously it can be used on live electrical equipment fires as well as with ordinary combustibles like wood, paper, plastics, textiles and rubber. This type of fire extinguisher is often referred to as ABE Dry Powder fire extinguisher, or ABE dry chemical fire extinguisher. The 4.5kg dry chemical fire extinguisher is the most common type of fire extinguisher used in Australia. It works by discharging a very fine powder that absorbs fuel molecules which chokes the fire of a fuel source. This fire extinguisher comes with fire maintenance testing tag. Buy from Fire Extinguisher Shop for the best in fire protection supplies. This dry chemical fire extinguisher is not recommended for use on or nearby sensitive equipment such as computers etc. The residue can be vacuumed up once it has dried but it can be hard to remove if it has contacted a very hot surface. This dry chemical fire extinguisher is not suitable for fires involving cooking oils. Have made 2 orders recently snd recieved quality products extreemly quickly. Very efficient and great prices. We ordered 5 x 4.5kg Dry Chemical Extinguishers and all arrived safely, promptly and in good condition. Excellent value for money. to recommend Fire Extinguisher Shop as a supplier. Went to buy elsewhere and decided to look around, this came in at half the price and the delivery was spot on. Easy website to follow – if needed I would definitely use this company again. A great product and price. Quick delivery at a great price. Great price, great service. Exactly what we required. Well priced compared with some others and delivery was at a reasonable price. After an inspection, we were asked to update our equipment immediately. In no time I found the Fire Extinguisher Shop online. A great price, tagged, with signage and delivered fast. They were on the wall in 48 hours. Problem solved. Thank you.